I got a very strong sense of deja vu when leafing through PLoS Biol recently. I was sure I had seen something very similar to Jeffrey Shaman’s paper Absolute Humidity and the Seasonal Onset of Influenza in the Continental United States before. Because this was PLoS, I was also able to print the full paper and compare. I couldn’t find any differences whatsoever between the two papers. In fact they were exactly the same except for a reshuffling of author order and an abbreviation in the title. Our policy until now (February, 2010) has been to allow resubmission of PLoS Currents content to another PLoS journal. However, the decision to include Currents in PubMed (and PubMed Central) has caused us to reconsider the status of content communicated via Currents, relative to other journals. I am certainly not convinced by this argument. Having personal experience of getting journals into PubMed, it is not something that happens immediately; the typical process is eight to twelve weeks and PLoS Curr Influenz was already accepted by PubMed in 2009. The accepted date on the re-submitted paper in PLoS Biol was January 20, 2010. And even worse still, the received date of the paper by PLoS Biol was September 10, 2009. PLoS Curr Influenz did not even accept the duplicate paper until December 18, 2009. The dates simply don’t add up, a journal doesn’t just email PubMed and expect to show content the next day, and feigning innocence just makes PLoS look at worst deceitful and at very best incompetent. If PLoS was aware that the paper had been submitted to both journals, and was aware that PLoS Curr Influenz would be listed on PubMed, they should have made a full disclosure on the paper subsequently published in PLoS Biol. Now, I am very much in favour of rapid communication journals, I think they represent an excellent platform to publish cutting edge research, but a distinction between these and traditionally peer-reviewed journals must be drawn somewhere. Should a publication like this really be submitting content to PubMed when their editorial policy allows re-submission in other PLoS journals? PLoS have been having their cake and eating it for a long time now. In a world where publication stats are frequently used as a method of judging the worth of a researcher, are the authors here benefiting twice from the same paper? 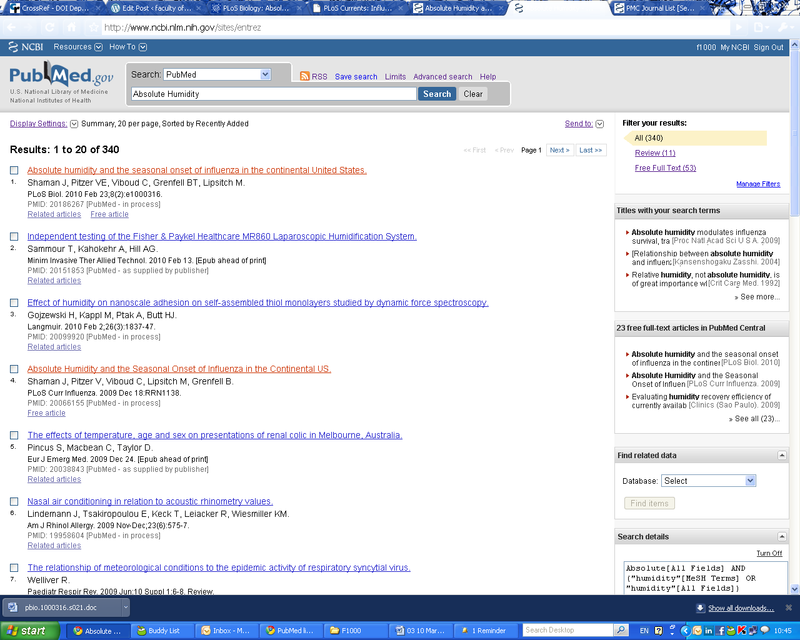 And PubMed has a very clear policy on duplicate articles, which PLoS should know about. So why didn’t they do it? Why didn’t they tell PubMed that they would be knowingly supplying duplicate articles? Well I do have a theory [snip-snip – F1000 Lawyers]… But it would be much better to see what you think. A recent evaluation on Faculty of 1000 Biology highlights a novel advance in the fight against adolescent obesity. In what could be considered the first behavioural trial to treat obesity (i.e. not based on a drug treatment), a team led by Anna L Ford at The Bristol Care of Childhood Obesity Clinic found that by retraining the eating habits of obese patients, sustained weight loss can be achieved. The trial centres around a new technology called the Mandometer, which has previously been marketed as a device to cure Anorexia-Bulimia. The device is essentially a set of weighing scales, linked to a computer, which monitors how much you are eating and how fast you are eating it. Participants record how full they feel on a 100 point scale at various times throughout the meal, and the device then tells them to eat more slowly or quickly depending on their answers. In recent years, we have come to redefine Anorexia-Bulimia as a behavioural or psychological rather than a medical condition. This study puts forward the argument that it may well be time to look at obesity in the same manner. An intervention aimed at slowing down speed of eating and reducing portion size through retraining eating behaviour is a useful adjunctive therapy to standard lifestyle modification in obese adolescents. Now it isn’t particularly surprising that when told what to eat, and how quickly to eat it, the trial participants lost weight. Nor is the conclusion that behavioural based eating interventions are a good way to sustain weight loss a real revelation. However this trial does offer some hope for making sure that patients retain a healthy weight after observation has ended, mainly because the device can be used at home and without supervision. Perhaps technology based solutions may provide a fruitful area of study in the future? Twitter, what is it good for? Hunh. There’s been rather an interesting couple of posts over at the Scholarly Kitchen, recently. What am I saying? They’re all interesting. Anyway, Kent Anderson says that blogs are for fogies and David Crotty talks about ‘talking’ vs ‘doing’. Elsewhere on Nature Network we’re re-visiting the meme of why do we blog anyway? (to which I’m not going to contribute, myself having decided to do rather than talk about). You can look up the links yourself if you can be bothered. Anyway, in the middle of a rather long and involved conversation, someone made a throwaway comment on David Crotty’s post. Then I thought it might be fun to see if I could write a scientific paper in 140 characters. But why stop there? Here’s a challenge for you. Your task is to re-write a scientific paper, a real, peer-reviewed and published one, in 140 characters. Twitter it with the hashtag #sci140 so we can track them (OK, so that’s 7 characters you’ve just lost but no one said it would be easy). You can do this as many times as you like, as many papers as you like, and it would be nice if they were your own, but they don’t have to be. I’ll see if I can get some f1000 swag for what I deem to be the best entry. 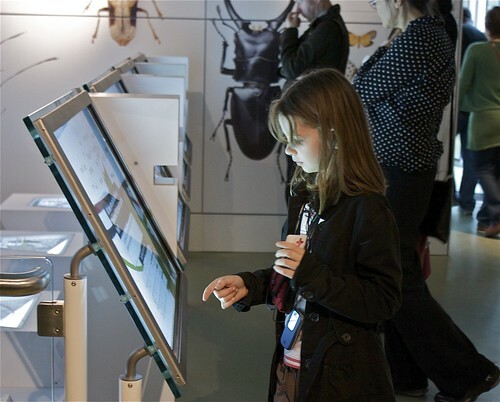 I took my daughters round the new Darwin Centre at the Natural History Museum last year. Because we happen to be friends, I managed to persuade the incomparable Karen James, of The Beagle Project fame, to show us behind the scenes. After that I took the girls into the ‘Cocoon‘, a huge butterfly egg-type structure that contains 20 million or more specimens, with superbly-done exhibits and displays. 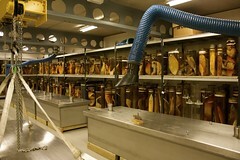 The Cocoon lets visitors see into the workings of the Museum; quite literally, because one side of the egg cuts away into the research labs (where Karen works). As we walked around we came across a video display of Karen herself, talking about the process of publishing science, how you write and revise a manuscript and send it off to the dreaded ‘peer review’. Karen did a splendid job explaining the process: how other scientists in your field look at your work and—in an ideal world—check that you’ve done the work right and that you’ve cited all the relevant literature; that the manuscript is sound. She also conveyed, far too convincingly, the heartbreak of having a treasured manuscript rejected! This leads to people making wide-ranging and inflammatory statements such as “peer review is broken.” Some of them even write letters about it (as reported by the Beeb, six months later). This leads to calls for making the peer review process ‘open‘; i.e. publishing the correspondence between the reviewers and the editors, and maybe even removing the anonymity part. but it’s not clear to me, and indeed the results of those BMJ studies tend to bear me out, whether this is really a problem, or whether the perception is far worse than the reality. And I’ve had a paper that took nearly two years to get published. I remain to be convinced that peer review is broken. The idea of some sort of clique quashing acceptance of manuscripts isn’t that far-fetched, pace Philip Campbell. Strong editors will get round it, but in some fields it’s quite possible for one or two individuals to make it really difficult to get anything published. This tends to be self-limiting though: in the extreme case, the field simply dies. In my experience of this, the community know who those people were, so open peer review probably wouldn’t improve matters. Double-blind will not work because it’s going to be reasonably trivial to figure out is the author. People will still sit on manuscripts, and we already know who does this when it happens. Making the reviewers’ comments, signed or not, public might not ‘improve’ peer review: however I do believe it has value. There is virtually no training in reviewing papers, and if young post-docs and grad students could see a wide range of reviews of many different papers, surely that can only improve their reviewing skills? Maybe it would even serve to make the first submission better if nascent authors were to look at reviews in their field, and discover the common mistakes? The EMBO Journal has been experimenting with publishing reviews of accepted manuscripts for a year now. I was amused to find that when I clicked on one of the reviews at random, it was a paper about my old friend talin. And it’s from Mark Ginsberg and Iain Campbell, FRS, with both of whom have I coauthored papers. Back when I was an acolyte in the service of science, I worked on an interesting little big protein by the name of talin. This 270 kDa sucker is involved in focal adhesions: the ‘ankle’ of the cell, joining the actin cytoskeleton to the outside world. Focal adhesions are fascinating and complex, and if I had access to my thesis right now I’d draw you a picture. You’ll just have to take my word for it. Talin is a molecule that back then was probably too big a problem for a grad student to tackle more or less single-handedly; the post-doc was was concentrating on some genetic analysis and my supervisor was taken up with the department’s computing services, which left very little lab time. I did manage to show that talin didn’t, as had been proposed, cap or nucleate actin polymerization (a negative result that was essentially unpublishable), and I also developed a long-term love of immunofluorescence microscopy. It appears we were ahead of our time: talin is closely involved with integrins (which see) and seems to be enjoying a (re-)surgence of interest lately. Back to focal adhesions. Formation of these structures, completely essential to cell adhesion and migration, has been pretty thoroughly prodded. What’s interesting is how focal adhesions disassemble, so that the moving cell doesn’t get stuck. 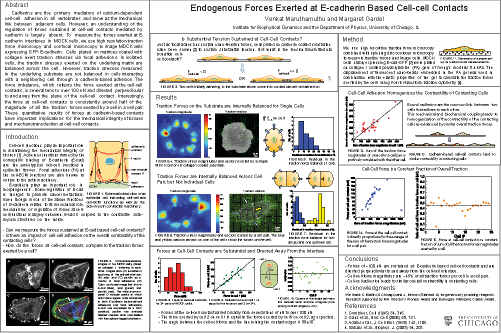 Again, this is something I had a professional interest in: one of my projects in Cambridge involved the determination of how moving cells generate the required motile force, or how they put their ‘feet’ forward’. We used a model system and discovered that essentially it’s gel effects. You take a load of little rods (= actin filaments), grow them, and the space they fill is disproportionately large, driving protrusion. What we didn’t do was look at the trailing edge of the cell, how the ‘foot’ comes up again. That was something I would have dearly loved to work on, and if I’d stayed in Cambridge, or even in science, I might have worked on it. The researchers used total internal reflection fluorescence and watched individual molecules on the underside of migrating cells scooting around. The clathrin sidled up to focal adhesions, hooked up with integrin; and the two left the party together. Just as we don’t think that our spaghetti/copper wire/gel effects produce all the force required for forward motion, neither is it certain that all focal adhesion disassembly is driven this way (the paper says that depleting clathrin reduces disassembly by 60-80%) . Talin itself has a head domain and an extended domain, and there is a calpain protease recognition site at the join (this was an immense pain when purifying the native protein; I had to make sure everything was swimming in protease inhibitors). Similarly, it’s possible that calpain actively degrades one or more focal adhesion components to make sure the whole thing gets packed away nicely, even if that does seem expensive in energy terms. It doesn’t stop there, of course. Somehow these integrins have to get recycled to the front of the cell. It would makes sense for the little blighters to make their way through known endocytotic pathways and be ready for reassembly into focal adhesions at the business end of the cell, this hasn’t yet been demonstrated directly. It’s probably a mass effect. He said, airily. The distribution and uptake of antivirals and vaccination was in the news quite a bit before Christmas. H1N1 swine flu didn’t turn out to be the Armageddon some commentators were forecasting, but I don’t think it’s overstating the case to say that we dodged a bullet there. In cases like this we might expect the government to give a clear message, based on the best possible epidemiology. No, please, stop laughing. After all, the UKian government was right about the MMR combined vaccine, even if they did handle the situation incredibly poorly. And that’s a problem, isn’t it? In our culture we don’t trust what the government tell us anymore. That may or may not be a good thing, but it certainly creates problems for public health policy, especially in a potential epidemic situation. Sometimes it’s quite clear what the right thing to do is, but how do we get them to do it? 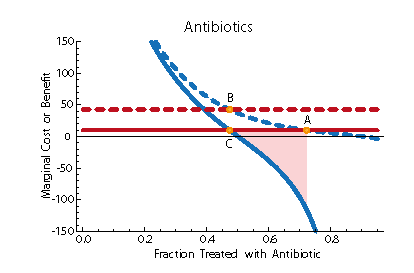 A paper just published in PNAS and reviewed on f1000 (link free for three months) sets out an economic framework for controlling transmissible and evolving diseases. Now, I’m not an epidemiologist (you should possibly go and talk to my mate Bill if you’re that interested), and the argument therein apply more to a healthcare system that is not free at point of care (Obama’s reforms notwithstanding), but it’s an interesting paper nonetheless. 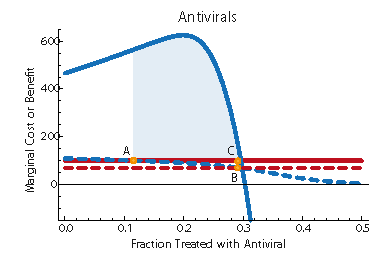 Pandemic influenza: antiviral treatment generates negative (resistance) and positive (reduced transmission) externalities. There’s a whole heap of math in this paper, and although (or perhaps because) I’m supposed to be coming up with robust formulae for our rankings on the main site, it makes my brain hurt. I find the thesis that economic impact can be leveraged to get maximum public health benefits an interesting one. I’m not sure how that would apply to the UK, for example, where the cost of healthcare is more-or-less invisible. One of the really great things about science is its potential for self-correction. If you have an hypothesis, a result (strange or otherwise), a set of data, it can be tested by anyone. This is encouraged, in fact: when you publish you’re not just saying ‘look how clever I am’ but also ‘here’s something new! Can you do it too?’. This philosophy is diametrically opposed to that behind Creationism, say; or homeopathy. In those belief systems whatever the High Priest says is of necessity true, and experiment must bend around them until the results fit. This means that, in science, a finding or publication that people get very excited about at the time can be shown to be wrong—either through deliberate fraud, experimental sloppiness (although the boundary between the two can be fuzzy) or simply because we’re as scientists wiser now than we were then. This happens, and it’s normal and part of the process. We should welcome it; indeed, my friend Henry Gee has claimed that everything Nature publishes is wrong, or at least provisional. So what we have to do is be completely open about this, no matter how embarrassing it is for the journal that published the work in the first place. If this worked it could be marvellous, superb. this work should be read with some caveats. Try as we might, my group, as well as many colleagues, and I have tried to determine the chemistry described […] In my opinion, this is a work that deserves a “Must Read” rating and I strongly encourage the reader to read the source material and reach their own conclusions. And as Derek points out, Science published an ‘Editorial expression of concern‘, noting a request for evaluation of the original data and records by officials at the authors’ institutions, as well as mentioning it on their blog. Heavy. Immediately I saw this, I let our Editorial team know we might have a problem and we published a note to warn our readers that the work described in the paper was suspect. There are many reactions shown that seem unusual and controversial […] My colleagues and I have tried to decipher the chemistry shown in Figure 1 of the main text and in the supplemental material. Many of the indicated reactions seem highly unlikely to occur, and the NMR data showing that some of the structures that were made are confusing and controversial. I agree wholeheartedly with the sentiments expressed in the Dissenting Opinion. The chemistry presented in this paper and in the online SI has varied in its description and content worryingly over the last 2 months. as yet no chemical samples or key reagents have yet been made generally available. It’ll be interesting to see when, not if, the original paper is retracted; and by whom. And this, people, is the self-correcting wonder of science. Remember this, next time someone starts rabbiting about scientific conspiracies, or sends you their new theory of general relativity, or anything else that sounds crazy. It probably is.